The fastest boat in our rental fleet, The Osprey can really fly! 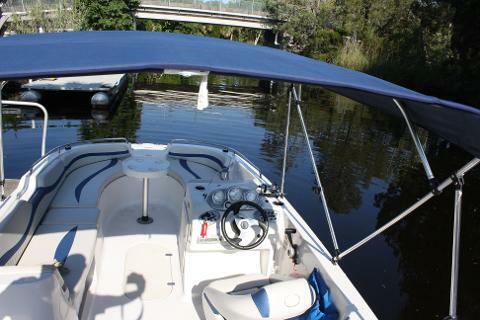 For experienced boaters familiar with these waterways, this boat is an awesome option! Rent for a half day or a full day, you can even pick it up the night before your rental and keep it overnight for a small fee! This boat conveys a real sense of freedom and we allow up to 6 passengers. 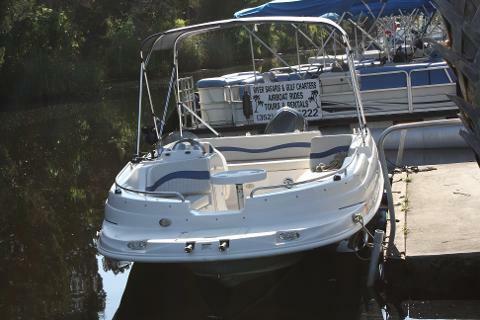 Our 19 foot Starcraft Deck boat is one of the finest vessels you can rent in Citrus County, with a 4 stroke 115 hp Yamaha engine it is powerful and dependable. 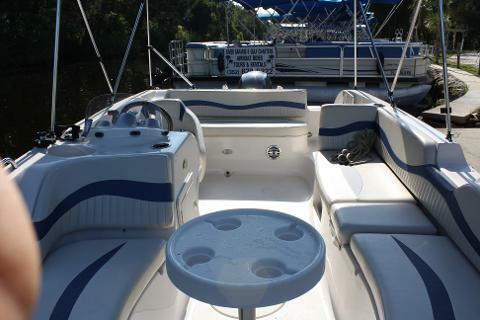 With bench seating and a small center table, it’s set up perfectly for a day of cruising with cocktails or fishing with the family. 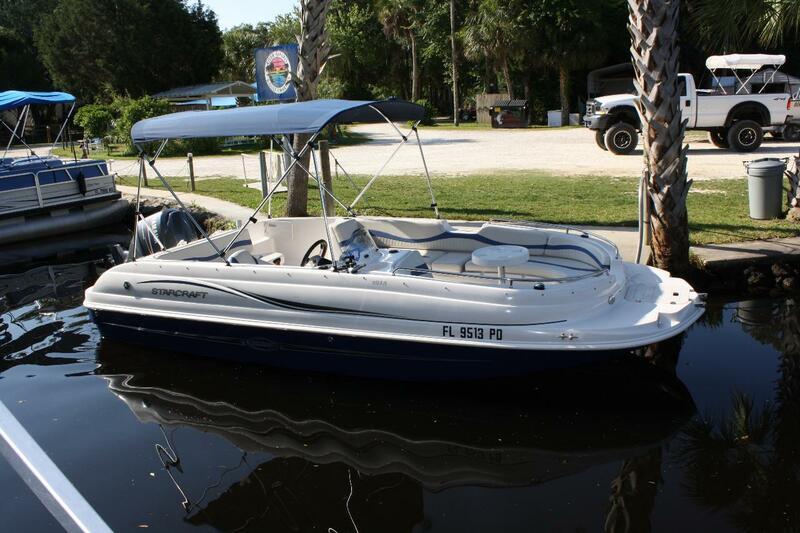 With a Bimini top, built in stereo, hydraulic steering, stern ladder and TONS of storage area, this boat is user friendly and very comfortable! 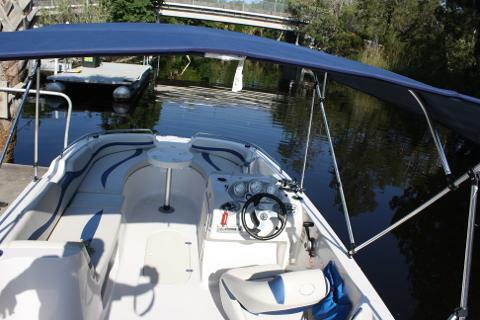 This is one sharp boat, clean enough for even our most discerning renters. When renting any vessel at River Safaris, you must stay within the channel Markers and the designated waterways for your own safety and the protection of our fleet. You must be 25 years of age or older to rent a boat! Have valid drivers license and credit card. No Alcohol allowed on rental boats. 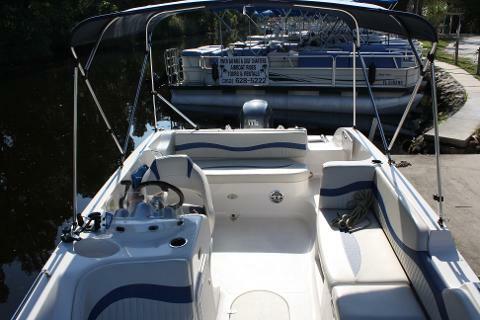 Extra: Captains for hire to drive your rental boat available for 1/2 day only at a rate of $100. This is in addition to the boat rental price and the Captain is not a fishing, scalloping or a tour guide, just your driver. Extra: Overnight rentals. Rent a boat and keep it overnight for $100 extra. Where do I pick up the boat? 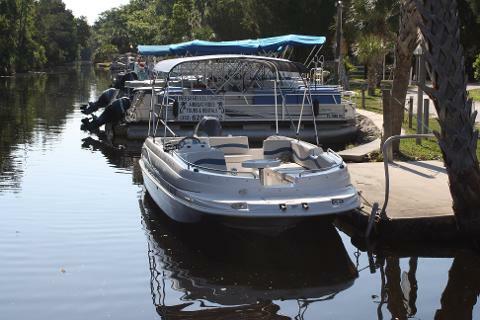 At our waterfront location-10823 W. Yulee Dr. Homosassa, FL. What are the hours? Full Day is from 8am until 5pm. Half day is 8am until 12:15 or 12:45 to 5pm. Once you have made a reservation we hold the boat for you so if you are not here at the time the rental starts you know you still have a boat. There are no extensions of these times due to your time of arrival. If you reserve a rental and do not show up or call, your credit card will be billed for that boat. The boat must be back at the dock and unloaded by 5pm or 12:15 depending on the rental agreement you have decided on. There are late fees applied to tardy boat returns. How long does it take to complete paperwork and get on our way? Plan for approximately 10 minutes to complete paperwork. Once that is completed you can drive your vehicle to the boat to unload. The time will vary depending on the number of people ahead of you and how long it takes for your group to gather and board the boat. Will you provide a map of the river? Yes and we will go over the map with you. Can we go into the Gulf of Mexico on your boats? Yes. You must stay where you can see channel markers at all times. Marker 10 in the Gulf is the furthest point you can go. During Scallop Season you can go out as far as marker 6. Why do I have to stay where I can see the markers? In case you need our help! We cannot find you if you cannot tell us where you are located. Why might I need help? If you have a breakdown or someone on your boat needs immediate medical attention. What happens if my engine breaks down? Check the troubleshooting information on the map we give you first. Call us and we will go thru possible solutions. If you are still having problems we will send a boat out to assist you. If the problem is mechanical and we can fix it that will happen on the spot. If it is not fixable we will attempt to provide you with another boat (if one is available)or tow you in. We work hard to keep the engines in good working order with regular preventative maintance. 90% of the time it is operator overheating the boats by pushing the engine to the maximum of its ability and continuing to run the engine when it is overheated. At times a renter may hit rocks or other obstructions in the water. If the problem with the engine is due to the operator the renter is responsible for all necessary repairs, towing fees, and damaged or lost equipment. What happens if I cannot tell you which marker I am near? You will need to call 911 and ask for a GPS location to be called into River Safaris so that we can locate you. You may not under any circumstances be out of the Homosassa River area NO GOING TO CRYSTAL RIVER OR CHASSAHOWITZKA RIVER AREAS. Will there be life jackets on the boats? Yes all adult vests remain on the boat and children’s jackets will be provided upon boarding. Reminder-Kids age 6 and under are required to wear their vests any time the boat is in motion. What other safety equipment will be on the boat? Everything required by Florida Fish & Wildlife Commission which includes: whistle, paddle, dive flag, fire extinguisher, anchors, throw cushion, SOS flag & flares. Do I really need to read my rental agreement? Yes! You will be responsible for the equipment you rent and you should be aware of your obligations. You will be offered prop and keg insurance; which we highly recommend. This is the most common damage and for $10 each you can be protected. Please read your agreement thoroughly because your boat will be accessed upon your return. Is it okay to follow the other boaters? NO! Follow the information we give you. Those other boaters may have experience navigating the area in their boat or they may not have any idea what they are doing. And never attempt to follow an airboat. How far is it to the Gulf? Springs? The Gulf of Mexico is approximately 6 miles and the spring area approximately 2miles. Note: the Scallop grounds are approximately 10 miles from our location and takes approx. 1 ½ hours each way. Is it slow speed all the way? No, during the winter months there are seasonal slow speed zones due to manatees being in the area. Watch for signs letting you know when you need to go at slow, idle or can increase the speed. Will the anchors always stay secure? No, anchors may need to be reset depending on winds and tides especially while scalloping. Always have a person stay on the boat who knows how to operate the boat should the anchors loosen or drag. Also, anchors can become lodged on rocks making them difficult to get out. Why can’t I book on line? If you are unable to book on line please call us at 352-628-5222 most likely we are close to being sold out for the day you are requesting and you must call to make sure we have availability. Do we let our boats go to the scallop grounds? Yes but only as far as marker 6 and you must stay where you can see a channel marker. If you need help and cannot tell us where you are exactly you are on your own. Never go out of the Homosassa area. Can I rent a boat for ½ day to go scalloping? No, because the scallop grounds are approximately 4 miles past the mouth of the river in the Gulf and takes over 1 ½ hours each way. We advise that you depart no later than 10 am when going scalloping. *Cancellation Policy- You may cancel your reservation up to 48 hours prior to your rental and your credit card will not be charged. Credit Cards will be charged 48 hours prior to your reservation. Cancellations after 48 hours will have a chance to reschedule or receive gift certificates. In the case of bad weather, your safety is always our top priority and we offer full refunds. If we have warned you of impending weather or bad conditions, and you choose to take the rental out against our warnings, you will not be refunded for your rental. We may work with you on refunding a portion of the rental upon quick return, but once you leave the dock ½ of your payment will be applied and not returned. Please always call and notify us if you need to change your reservation. • Note: There may be times when a boat becomes unrentable due to damage or mechanical failure. If this should happen we make every effort to notify you as soon as possible. 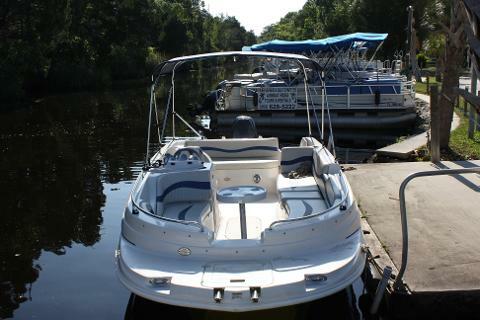 We determine cancellation by the date the reservation of a boat rental is made. Make your reservations early to avoid this happening to you!